With the nature of the Internet and spoilers, I already knew about this week’s big Game of Thrones event. But as the episode progressed, I realized there was plenty of excitement to be found before Daenerys (Emilia Clarke) blows the doors clear off this season. Continue reading for more, but beware of heavy spoilers if you’re not yet caught up. So much of “And Now His Watch Is Ended” focuses on the women of Westeros and how they’re infinitely smarter than the men they find themselves with. Jamie (Nikolaj Coster-Waldau) and Brienne’s (Gwendoline Christie) scenes this week show just how far the Kingslayer has already fallen after the loss of his hand. But it’s Brienne that reminds Jamie that he’s not weak and that he’s fully capable of still being the man he once was, despite his lingering doubts. Jamie’s resistance early in the episode show that he’s still got a bit of fight left in him, but he is an incredibly different man now. I imagine his journey to redefine himself is only just beginning and I suspect Brienne will play a large role in shaping that transformation. In King’s Landing, Cersei (Lena Headey) and Margaery (Natalie Dormer) are beginning to quietly wage a war over Joffrey (Jack Gleeson). Cersei had every right to be worried about Margaery’s presence (a fact she had expressed earlier this season), but now that threat is becoming real in a very tangible manner. The current Queen hasn’t ever had much control over her son and what little influence she has left is slipping away, quite the reverse of what the Lannister daughter is accustomed to having. I also have to imagine that Tywin’s (Charles Dance) reaction to Margaery’s creeping influence was quite the opposite of what she was excepting. Speaking of Margaery, the Tyrell is playing the game on an epic scale, bringing in Sansa (Sophie Turne) underneath her wing. Part of this arrangement is certainly set into motion by Olenna (Diana Rigg) and Varys’ (Conleth Hill) scheming, but what sells the moment is Margaery’s (seemingly) genuine care for the Stark girl. As telegraphed as that moment has been, it’s still nice to see Sansa might have a few friends left in King’s Landing. So. Let’s talk about the main event. It’s amazing to me how well-earned Daenerys’ moment in this episode was. 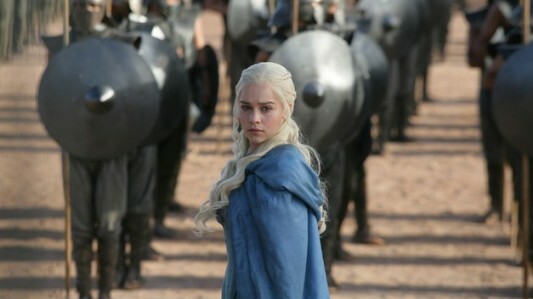 In some ways, it felt like the show had been building to this all along (much like how season 1 was building towards the death of Ned – although I never saw that coming, I did see Daenerys’ rage on the horizon, especially with all the dragon-related promotional material HBO was shopping around). Even though I knew the moment was coming, the impact of gravity of those final minutes is easily one of the show’s most iconic moments. The transformation Dany has undergone over these past season has been incredible to watch and even more satisfying to root for. Those moments finally paid their dividends this week in an episode already filled with plenty to be interested in. Daenerys Targaryen has arrived, folks. I hope everyone else is prepared. – If Dany’s murderous rampage wasn’t enough violence for you, the events beyond the wall still have me reeling. – Hilarious to me that Joffrey spends so much time highlighting the Targaryen’s downfalls, knowing what we know about Daenerys, the young King won’t be laughing for much longer. – “Dracarys!” Chills, ladies and gentlemen. Chills. What did you think of this week’s fantastic episode. Sound off in our comments!